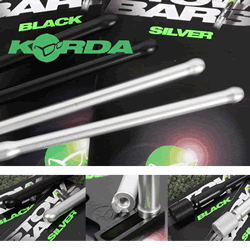 Stow Bars are the ultimate snag-fishing accessory. They are rod-retaining bars that allow you to fish locked-up, with the clutch screwed down tight, without the worry that you might lose a rod on a vicious take. They are available in black and silver versions to suit your personal preference. Each lightweight aluminium retaining bar screws into the bracket independently, allowing you to fish with both bars, or just the one.